In the 29 years that towboat captain Joe Gray has worked flotillas of barges up and down the Ohio River, he has witnessed the decline at the heart of industrial America in what is known as the country's Rust Belt. Gray, 46, spends up to eight months a year doing 28-day stints on the barges carrying coal, corn and gravel between Pittsburgh, Pennsylvania and Cairo, Illinois. Some 600 million tons of goods still flow each year along 25,000 miles of U.S. waterways. But he has seen a growing number of coal-fired power plants being dismantled, from Indiana to West Virginia, and says barges loaded with coal have dwindled in the face of cheaper natural gas and tougher environmental regulations. It is a decline that President Donald Trump has promised to turn around, with a revival of coal, manufacturing and infrastructure. Those promises have played well among many communities along the river. Populations in some smaller river towns have dwindled, leaving half empty downtowns and derelict factories. "Them towns are all drying up," Gray said. "People are really struggling." The population of Portsmouth, Ohio, has thinned by more than 20 percent from the 1980s, according to U.S. Census data, an era marked by the closure of an Empire-Detroit steel plant that triggered layoffs of 1,300 workers. Nearly 36 percent of Portsmouth's residents now live below the poverty line, Census data showed, much higher than the national average of 16 percent of the population. The opioid abuse epidemic has hit particularly hard in Appalachian towns such as Portsmouth, with addiction and overdose deaths taking a further toll. Although the coal industry work force has expanded slightly over the past year, U.S. coal mining jobs are down more than 70 percent since the mid-1980s, according to the U.S. Labor Department. 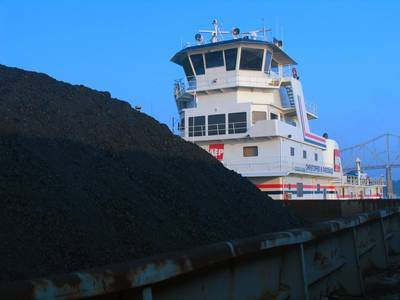 Coal shipments on the Ohio River have tumbled 33 percent in the past decade, U.S. Army Corps of Engineers data shows. With good jobs scarce, Gray said towboat deckhand jobs have become more prized. Staff turnover in the barge trade is less frequent, he said. "I've got people calling me every day wanting me to get them a job," he said. Gray grew up in Racine, Ohio, and still lives in the small town on the river, with an old power plant directly across the water. After his brothers worked as towboat deckhands, he followed them into the trade in 1988. He worked his way up to captain, earning $45 an hour. He has two children, one of whom also became a deckhand. But the absences have taken a personal toll. "This river life is pretty hard on a marriage," he said. Piloting the 126-foot towboat Tommy H., owned by his employer Campbell Transportation, he said he pushes a lot less coal these days. More often the cargo is lubricant oil or grain. About 60 percent of U.S. grain is moved by river barges. Record U.S. harvests have made grain transportation one of the brighter lines of business for the barge trade. Aging infrastructure means barges are sometimes victims of canal lock delays. Campbell Transportation estimated it lost $1 million in revenue in September and October because of the delays. Gray often runs his towboat, which combined with a full complement of barges can reach to more than 1,150 feet (350.5 m) long, 24 hours a day with two teams of crew members including a relief captain, lead deckhand and sternman - working six hours on and six off. Days and nights of slow motoring are broken up dropping off barges and picking up different new ones along the route, in places like Apple Grove, West Virginia and Owensboro, Kentucky. It requires nervy precision to pass narrowly through locks with just a few feet to spare on either side. The remnants of an industrial past - docks to load coal from the mines of Appalachia and depots full of road salt or grain - line the river. Some mid-sized cities such as Louisville have cleared out riverside industry and found new ways to thrive, Gray said. Whether Trump's administration can revive other communities on the river remains to be seen. "I'm hoping like hell that he turns this economy around," he said.